You may recognize the phrase, "Resistance is useless!" 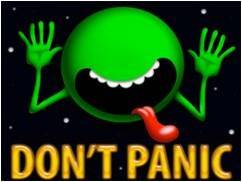 as the battle cry of the Vogons in Douglas Adam's "Hitchhiker's Guide to the Galaxy." So what's all this about resistance? I discovered this morning that by using the elliptical machine with zero resistance, I can still do a hard workout without hurting my injured hip. I woke up this morning and tested my hip as I made my way downstairs. It still felt a little sore, but my mobility seemed fine. I wasn't fooled into thinking that I could get away with an outdoor run today, but did consider other options. It seems that the intense pain that I'm experiencing while running manifests only when I run on the road. A recent trail run had gone well, and a handful of treadmill sessions have caused me little problem. After some gentle dynamic stretching, I decided to test things out on the elliptical while my wife did her morning treadmill run. My theory that I would do okay with lower impact workouts quickly proved out. I started my session at neutral resistance and, instead of ratcheting that up to a mid-high level as I normally do, I just began moving. It felt a little too easy, so I increased my speed to get my heart rate going. This session provided a good aerobic workout and I generated enough of a sweat to be satisfied with the effort. My hip felt the same from start to finish, with none of the stabbing pain that caused me to cancel yesterday's run after three minutes. I'm pleased that I have an alternative to running while my hip gets better. I will miss the opportunity to run the trails of Vermont this weekend, when we visit my brother and his family. I'll gladly settle for a hike though. With only three weeks to go until my next race, I don't need to make my injury any worse than it is already. Where in Vermont? My hardest half marathon was in Waitsville. Good idea to take it easy before your race. I'm sure your orthopedist appointment can't come soon enough. Have a great relaxing weekend. We were close to Burlington and then spent time in Waterbury and Stowe. I think your race was a little south of there. I'm certainly considering a destination race in VT. But definitely not on a course as difficult as you described!